For nearly 1,000 years, mathematicians have studied a remarkable pattern of numbers called the Fibonacci sequence. The Fibonacci numbers lend themselves to math fair projects in part because they appear so often in the natural world and are thus easily illustrated. The first two numbers in the Fibonacci sequence are zero and one. Each new number of the sequence is computed as the sum of the previous two numbers. So the sequence looks like this: 0, 1, 1, 2, 3, 5, 8, 13, 21, 34, and so on. A concept closely related to the Fibonacci numbers is that of the golden ratio. To illustrate the golden ratio, take any two adjacent Fibonacci numbers and divide by the number just before. For example, take the Fibonacci sequence shown above and create the following: 1/1=1; 2/1=2; 3/2=1.5; 5/3=1.666; 8/5=1.6; 13/8=1.625 and so on. As you take larger and larger numbers in the Fibonacci sequence, the ratio gets closer and closer to the value 1.618034. Subtracting one from this number leaves just the fractional part -- .618034 -- sometimes referred to using the Greek letter phi. Gather together a cauliflower, apple and banana. Observe how the cauliflower's individual florets are arranged in spiral patterns. Count and record the number of spirals. Photograph the cauliflower and, on the photograph, trace its spirals with a pen. Slice the apple in half widthwise and photograph the two halves. Note and record the Fibonacci number on each half and trace each with a pen on your photograph. Cut the peeled banana in half and look at its center to see a Fibonacci number. As with the apple, photograph the two halves and use a pen to outline the number. Start a sunflower plant from seed. As it grows, you will see that, when the plant is viewed from above, the leaves bud in a circular fashion. As they appear, measure the angular distance counterclockwise from each other. Record the angle of rotation of each successive leaf emergence. The angles you measure should consistently be about 222.5 degrees, which is .618034 times 360 degrees. It turns out that since rain and sun fall on the plant from above, this angle of leaf emergence provides the optimal coverage for sun and water without blocking the leaves below. Your project illustrates that the ideal angle for leaf emergence follows the golden ratio -- .618034 -- or phi. On a sheet of graph paper, draw two small squares side by side of length 1. Directly above these two squares, draw another square of length 2. The bottom of this square touches the tops of the two length-1 squares. To the left of these three squares, draw another square of length 3. It will be touching the left side of the 2-inch square and one of the 1-inch squares. On the bottom of these four squares, draw a square of length 5. On the right side of this growing array of squares, construct a square of length 8. On the top of this growing array, construct a square of length 13. Notice the lengths of each successive square are 1, 1, 2, 3, 5, 8, 13 -- or the Fibonacci sequence. You can construct a spiral by drawing connected quarter arcs inside each successive square. This spiral resembles the shell of a chambered nautilus, as well as the spiral arrangement of the seeds in the sunflower. 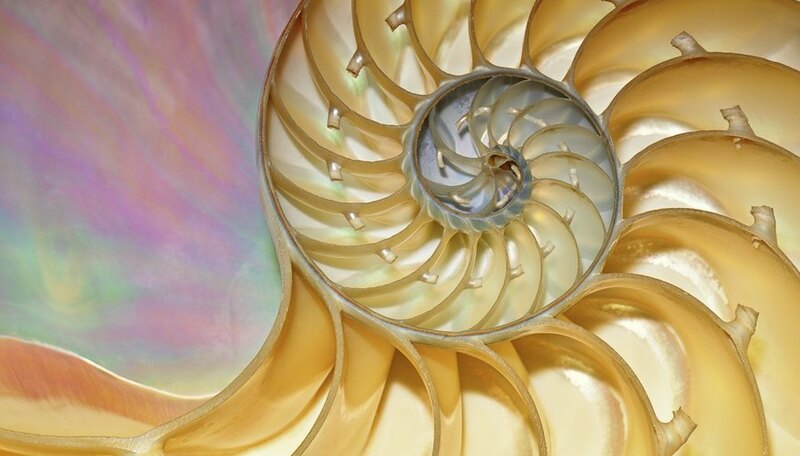 Fibonacci Numbers and Nature - Part 2: Why Is the Golden Section the "Best" Arrangement? Betsy Beacom is a writer and editor with experience in education, marketing, Internet content, social media, the performing and visual arts, literature and more. She holds bachelor's, master's and doctoral degrees in literature, has taught English at Yale University and has more than 20 years' experience writing and editing. Beacom, Betsy. "Math Fair Projects on Fibonacci Numbers." Sciencing, https://sciencing.com/math-fair-projects-fibonacci-numbers-7905214.html. 25 April 2017.